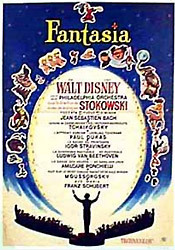 Disney's ground-breaking animated feature-length "concert" film milestone, with great works of Western classical music, was an outgrowth of the "Silly Symphony" series. An ambitious experiment to try to popularize classical music, especially by accompanying it with animation. It integrated eight magnificent classical musical compositions interpreted with enchanting, exhilarating, and imaginative, artistically-choreographed animation. The film, with a production cost of more than $2 million (about four times more than an average live-action picture), initially failed at the box-office, partially due to the expensive installation of "Fantasound" sound reproduction equipment in theatres. The "Fantasound" 'stereo-like', multi-channel soundtrack was an optical 'surround-sound' soundtrack printed on a separate 35mm reel from the actual video portion of the film. It was the first American film to use stereophonic sound as well as the first and only film recorded in Fantasound. 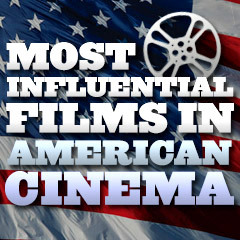 The film received a special certificate at the 1941 Academy Awards for its revolutionary Fantasound (early stereo). Originally, the film was to consist of only the classic Mickey Mouse segment: "The Sorcerer's Apprentice." The only Walt Disney animated feature film that was two-hours long, at 124 minutes. Often imitated or duplicated - e.g., Disney's own 'unofficial' sequel Make Mine Music (1946), Bruno Bozzetto's Allegro non troppo (1976), parts of The Land Before Time (1988). A fresh, sophisticated, and classic masterpiece, and probably the world's most famous and highly-rated film, with its many remarkable scenes and performances, cinematic and narrative techniques and experimental innovations (in photography, editing, and sound). Often considered the "greatest film ever made" on most 'best of' lists. A prime example of the director-centric auteur theory before it was clearly defined decades later - it showcased the achievements of a maverick director-cowriter-producer-star in one film, 25 year-old independent wunderkind Orson Welles, who was the controlling author of the film (not the studio, screenwriter, producers, or others) - it was his debut feature film over which he was given total freedom by RKO. With his four Academy Awards nominations (Best Picture-producer, Best Actor, Best Director, and Best Original Screenplay), Welles became the first individual to receive simultaneous nominations in those four important categories. The innovative, bold film is an acknowledged milestone in the development of cinematic technique, with many advances in cinematic movie-making. It brought together and consolidated everything in 'film-language' up until that time, and then broke some new ground with deep focus photography, unconventional lighting, including chiaroscuro, lengthy takes, low-angled shots revealing ceilings in sets, sophisticated directional sound editing, overlapping dialogue, the sound technique termed "lightning-mix," elaborate camera movements, and flashbacks, flashforwards and non-linear narrative story-tellin (shot from various viewpoints). The film began with just a title screen - no performer names - an unprecedented thing in the early 1940s, although common place today. Welles was a trailblazer for future film-makers who wanted to expand the boundaries of film, such as Francis Ford Coppola, Martin Scorsese, and Quentin Tarantino. A great example of how external forces can ruin (or help) a film's chances - i.e., publishing tycoon William Randolph Hearst accused the film of wrongly portraying him as a ruthless, publishing tycoon who died alone in the castle. d. John Huston, 100 minutes, Warner Bros.
One of the most popular, stylistic and best classic detective mysteries ever made - a mixture of mystery, romance, and thriller. Many film historians consider it the first major dark film noir production in Hollywood - although it had antecedents. Some of the other most influential noirs of the time period included Double Indemnity (1944) and The Blue Dahlia (1946) (with Alan Ladd). The low-budget film reflected the remarkable directorial debut of John Huston (previously a screenwriter) who efficiently and skillfully composed and filmed this American classic for Warner Bros. studios, with great dialogue, deceitful characters, a great femme fatale, and menacing scenes. B-movie lead character Humphrey Bogart, now introduced as a 'good guy', presented the definitive anti-hero Sam Spade - a cynical, cool San Francisco sleuthing private-eye who lived by his own code of ethics. There were only two of the lead-based, bejeweled Maltese Falcon statuettes originally created by the Props Department for the film. Each lead figurine was 45-pounds and 12 inches tall. The only known film-used Falcon sold at auction for almost $4.5 million in late 2013 - making it one of the rarest and most important movie props or memorabilia ever offered for public sale. The black bird served as the film's McGuffin, a plot device that propelled the story forward but was proven ultimately worthless - although it wasn't termed that at the time. Detective Spade famously called the worthless fake statuette: "the stuff that dreams are made of" (cribbed from Shakespeare's The Tempest). When originally considered for release, the censorial Hays Code office was concerned about the amount of drinking, cursing, and sexual innuendos in the risque film, especially the amoral and promiscuous Mary Astor character. Also, they considered the homosexual references unacceptable (Peter Lorre's effeminate homosexuality, and young homosexual "gunsel" Elisha Cook, Jr.), and they had to be toned down. A delightful, classic, nostalgic, poignant, and romanticized musical film - and one of the greatest musicals ever made - a gem of cinematic, picture-postcard Americana and youthful romance. A favorite Christmas-time holiday film classic. The Technicolor film marked the beginning of the golden age of MGM musicals (and legendary producer Arthur Freed's unit), and ultimately became the second most successful film for MGM (behind Gone With the Wind (1939)). The film abandoned the 'put-on-a-show' mentality of so many other backstage song/dance films, or the Busby Berkeley-style of show-stopping production numbers. Its songs and wonderful performances were carefully and naturally integrated into the story of the close-knit family's day-to-day life, and served to thematically advance the action and plot from one season to the next. The film was composed of a series of coming-of-age vignettes (four in number): different acts representing the seasons from summer 1903 to spring 1904 that conclude in the year of the St. Louis World's Fair/Exposition. Each segment marked changes and rites of passage - and was introduced by a filigreed tintype from the Smith family album - each static, initially sepia-toned image turned into color and came to life. This film marked the first significant film role, and probably her career-best effort, for beautiful actress Judy Garland since The Wizard of Oz (1939).